At her West Berkeley commercial kitchen, Kelsie Kerr serves exquisite Californian cuisine for breakfast and lunch. 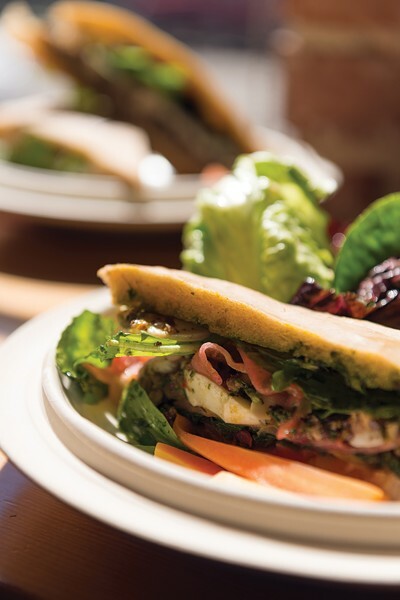 The sandwiches change daily, but they always reflect chef Kelsie Kerr’s sandwich philosophy. Standard Fare takes up 800 square feet, and most of it is kitchen. At the fanciest of fancy restaurants, you can pay hundreds to eat at the chef's table — basically, a table in the kitchen where you can watch the action throughout your meal. At 4-year-old Standard Fare, that's the default. As soon as you walk in, you're greeted by pots clanging and knives chopping and the most gorgeous, colorful food being walked mere steps to their devourers, seated at one of Standard Fare's 10 bar stools. I went to West Berkeley's Standard Fare because I had recently met Jeff Mason, the sandwich guru behind the beloved pop-up Pal's Takeaway, at a party. I asked him if he liked any East Bay sandwiches apart from his own, and he quickly said no. Then he hesitated and corrected himself. "I do like Standard Fare," he said. But that's it. My first bite of Standard Fare sandwich glory starred a thick slice of frittata, teeming with marinated shiitake mushrooms, sweet potatoes, and caramelized onions. Shreds of pickled daikon spilled out from one side, while layers of hummus and cilantro-sorrel pesto kept the eggs and sautéed leeks in place. The bread performed beautifully — soft but sturdy, never soggy, and proportionally perfect. One came with a whisper-thin layer of salami, a salty accent to the rest of the ensemble's ingredients: celery root rémoulade, scallions, roasted cabbage, tomato sauce, aioli, and fresh arugula. Another featured house-made bacon, creamy avocado, and golden beets that tasted like candy. If I had to choose a favorite, it'd probably be a vegetarian sandwich with roasted purple carrots, marinated butternut squash, frilly greens, white daikon, kohlrabi, hummus, and cilantro-celery pesto — a symphony of textures with lovely balance and acidity. Chef-owner Kelsie Kerr serves one vegetarian and one omnivore sandwich on a menu that changes every day. They're hyper-seasonal and reflective of Kerr's own pickiness. "I have all sorts of philosophies about sandwiches because I don't really like sandwiches," she said. She tends to work backwards when developing recipes. For example, why do you put sandwiches on tomatoes? They're juicy, acidic, and full of umami. So, she always makes sure she has those elements — and some kind of fat — in every sandwich. Homemade aioli is a must with her meat sandwiches, while the vegetarian ones always get some kind of pesto and hummus. ("I never thought I'd be a house of hummus," she quipped.) Fresh greens are the final essential element, and they all go into two slices of bread that she developed specifically for Standard Fare's sandwiches. It resembles focaccia in appearance, but there's no oil in it. Instead, it gets a slight sour flavor from natural fermentation and a subtle nuttiness from whole grains. Standard Fare is much more than a sandwich spot, though. Kerr is one of the most widely respected chefs in the East Bay. She spent years as a chef at Chez Panisse, co-authored two seminal cookbooks with Alice Waters, and co-opened Berkeley's esteemed Cafe Rouge. In 1997, Food & Wine Magazine named her one of the country's best new chefs. Kelsie Kerr (center) stands with her team in Standard Fare’s large open kitchen. 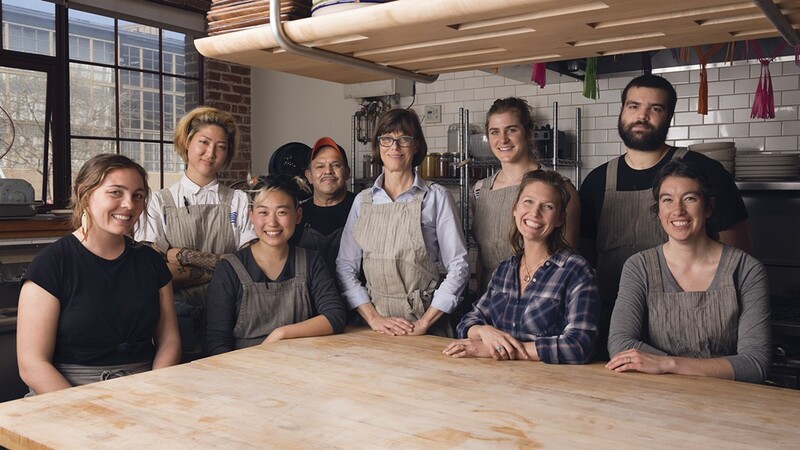 When she opened Standard Fare in 2014, Kerr initially intended for it to be a high-quality, zero-waste takeout spot where diners got their California cuisine in locally made ceramic pots. That aspect became a bit cumbersome, though, when folks inevitably came in wanting a quick lunch and didn't wish to sign a contract, carry heavy dishes around, and lug them back a week later. Eventually, Kerr added seats and dine-in options. She launched dinner service. She took away dinner service. She bought an espresso machine. Now, it's a popular neighborhood spot for breakfast and lunch — the sort of place where everyone seems to recognize each other and Kerr knows almost every customer by name. At lunch, there's always soup, salad, two sandwiches, and one special entrée. The latter is always a fully composed, multi-component, balanced meal at a quality far higher than you might expect for the price. One day, I feasted on romanesco and onion rings fried in a light, tempura-like batter, paired with a spiced aioli and gremolata. The highlight laid beneath: a bright, lemony ragout of white beans, leeks, and rapini. On Mondays, Kerr always fries chicken but serves it with different accompaniments. She skips brining in favor of tossing pieces in spiced, whole wheat pastry flour and frying them in house-made lard. With a thin, crispy coating, it was simple and delicious topped with a drizzle of green goddess dressing. I loved that dressing on the little gem salad it came with, too, and only wished there was more of it to spruce up the black beluga lentils and cardoons that filled the rest of the plate. Soup with salad is a popular combo as well. I inhaled a rutabaga soup with black pepper-celery seed crème fraîche that coaxed out the vegetable's remarkable sweetness, followed by a bulgur wheat-chickpea salad with pops of preserved lemon, herbs, and roasted daikon. The grain salad option changes weekly. Breakfast and brunch are similarly wonderful. Kerr lines the counter with tempting pastries and a daily frittata that's strikingly thick, colorful on the inside, and blackened on the outside. I tried one loaded with carrots, marinated daikon, and collards, and it felt surprisingly meaty and substantial with delightfully crispy edges. Unlike most frittatas, this one tasted more like a mound of luxurious vegetables merely bound together with eggs. That's how Kerr likes them — more Spanish tortilla style. She even adds extra oil to the eggs, just as the Spaniards do. You can't really go wrong with the pastries or desserts, although the sticky bun is the most correct choice. I've never had a sticky bun quite like it — slightly savory, nutty, and malty, spiced with cardamom, cinnamon, and black pepper. It's topped with crushed almonds and a barley malt caramel, which really sends it over the edge. But it also has this outrageously soft, gooey yet light texture, which I can only guess has to do with Kerr's intentional blend of two heirloom flours. Get this bun on Saturdays only. I also loved the unusual gougères, with their crispy exterior giving way to salty cheesiness and tangy sauerkraut. The layered carrot cake, dotted with poppy seeds and coated in walnuts, and olive oil cake, moist and citrusy with glistening rings of blood orange on top, were both lovely, if a little more typical. On nice days, folks can sit outside as well — there's plenty of sunny seating along with stools to use as small tables along the brick warehouse space known as the Berkeley Kitchens. But I prefer eating inside for the chef's table experience. It's exciting, bustling, and full of details to take in, like the jar of white tulips perched near the ceiling on a ledge carrying ceramic plates. Hours: Mon.–Fri. 8:30 a.m.–4 p.m., Sat. 11 a.m.–3 p.m.